Disease Eradication: Is It Worth the Trouble? As Yamey, a professor of global health and public policy, noted, we’ve only ever eradicated one human disease (smallpox) and one animal disease (rinderpest). But the hope of completely wiping out other infectious diseases—such as polio, Guinea worm and yaws—continues to enthrall the global health community. Why is eradication so compelling? And what makes it so challenging? 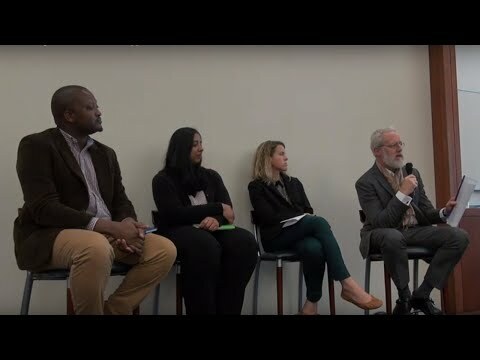 These are some of the questions addressed by the panel, comprised of DGHI director Chris Plowe, associate professor Megan Huchko, assistant professor Lavanya Vasudevan and research scholar Osondu Ogbuoji. What’s so great about eradication? As several of the panelists pointed out, the vision of eradication is alluring to donors because it represents significant worldwide impact, paints a picture of international collaboration and typically has a clear timeline and endpoint. Disease eradication can also be seen as a cost-effective initiative. “If we’re successful in our efforts, we’ll no longer need to spend money on preventing or treating that disease, and future resources can be allocated elsewhere,” Ogbuoji argued. Ogbuoji also characterized eradication as a “public good,” noting that everyone across the world can enjoy the benefits of eradication. Huchko echoed the social justice argument in the context of eliminating cervical cancer—a disease, she said, that’s “the poster child for health disparity” despite significant advancements in the development of low-cost screening protocols and effective vaccines for human papillomavirus, the main cause of cervical cancer. For all the positive reasons to pursue eradication of key diseases, there are at least as many challenges. Yamey kicked off the discussion with a list of them: “It’s really hard to maintain interest, funding, motivation and political will. It’s expensive. It’s risky. War can disrupt the effort. Political upheaval can disrupt it,” he said. And then there’s the “future lives versus current lives” conundrum. “When we think about eradication, we’re thinking about saving people today and the people who are not yet born from a particular disease,” said Ogbuoji, raising the question of allocating resources for future lives versus channeling those resources to living people who suffer from serious diseases that are not in the eradication agenda. Implementing the eradication effort in remote, hard-to-reach places—sometimes called “the last mile”—is particularly challenging. Citing D.A. Henderson’s book, Smallpox: The Death of a Disease, Vasudevan noted that community health workers were critical in reaching people in these areas and gaining their trust and acceptance of the vaccine, ultimately playing a pivotal role in the success of the smallpox eradication campaign. Changing people’s behavior, a notoriously difficult undertaking in any context, can be a major barrier in the uptake of vaccines, which are a central component of many eradication campaigns. Vasudevan shared the World Health Organization’s “3 C’s” framework for vaccine hesitancy—complacency, convenience and confidence—and noted that targeted behavior change strategies are often needed to combat these challenges. For example, in rural areas in Tanzania where she’s worked, some children aren’t vaccinated because their parents may not know that vaccination programs are available. In these cases, she said, providing information by SMS message or reminding parents that they need to bring their children in for vaccinations can be effective in addressing this complacency. And yet another complicating factor is that, while eradication requires a truly international effort, varying levels of resources and commitment across countries and regions are inevitable. Furthermore, countries and regions that have managed to eliminate a disease must continue to monitor for new cases while other areas of the world are still working on eliminating the disease in their communities. So is eradication worth it? The panel, from left: Osondu Ogbuoji, Lavanya Vasudevan, Megan Huchko and Chris Plowe. Not pictured: Moderator Gavin Yamey. The rationale for eradication, as stated eloquently by Melinda Gates, is really one of social justice.